I am thankful for being a middle class person today instead of the richest person in the world 200 years ago. I can have a real time conversation with someone who is 1,000 miles away. I can get from New York to California in hours instead of weeks. Antibiotics will save my life if I step on a rock and cut my foot. I don’t have to worry about getting smallpox, measles, or polio. I can eat ice cream in July, without having to hire an expedition to climb a mountain to bring back ice. I could buy an air conditioner if I wanted one (although I don’t actually have or want one. I live in Pittsburgh, and don’t think it’s necessary). But think about being a rich person living in Atlanta in July before air conditioning was invented – that would have sucked. I can listen to just about any music, watch just about any movie, or watch just about any episode of just about any TV show, whenever I want. My access to information online is bigger than any library that the richest person owned in the past. I have a flush toilet. I can take a hot shower whenever I want. I don’t have to worry about my drinking water being infected with deadly bacteria or parasites. My clothing is more comfortable than any that existed in the past. I have zero problem with the fact that there are some people today who have thousands of times as much money as me. I am grateful for what I do have. I am not resentful for the fact that other people have way more money than me. November 22, 2017. Tags: Economics, Holidays, Income inequality, Occupy Wall St., Thanksgiving. Economics, Holidays. Leave a comment. December 30, 2016. Tags: Arts and crafts, Christmas, Christmas presents, Clothing, Crafts, halloween, harvest hollow, home decor, jewelry, nerdgirl20, owls, Videos. Holidays. Leave a comment. 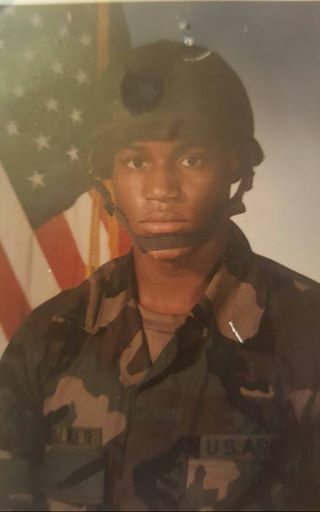 Ernest Walker: Served Proudly 25th Infantry Division Tropic Lightning I was only 16 and homeless I had ran away from home at 13 and slept in 23 different houses when a recruiter saw me sleeping behind a Kroger and I sign up and it SAVED MY LIFE !!!!! A black veteran says that he was refused a free Veteran’s Day meal at Chili’s after a man wearing a Trump shirt called his military service into question. On Friday, Ernest Walker visited a Chili’s in Cedar Hill, Texas, planning to partake in the chain’s offer of a free meal for military veterans, CBS 11 reports. Walker says everything was normal as he ordered his food. Then, he was approached by a man who questioned his military service. “I was approached by an old white guy, maybe in his 70s, with a Trump shirt, at Chili’s on Veteran’s Day yesterday… He said he was in Germany, and that they did not let Blacks serve over there,” Walker wrote in a Facebook post on Saturday. Walker told Dallas News he was stationed in Hawaii in the 25th Infantry Division during the late 1980s. Black soldiers have fought in every American war since the Revolutionary War, including World War II, though often in segregated units. Walker said that as he prepared to leave with a to-go box of food, he was approached by the Chili’s manager, Wesley Patrick. Walker said Patrick told him that another customer had reported he was not a real veteran, and that his dog, who was with him at the restaurant, was not an actual service dog. In the video, Patrick repeatedly tells Walker he needs to leave, eventually taking away his to-go box of food. Walker said in another Facebook post that he joined the military when he was only 16 years old, at a time when he was homeless and sleeping behind a Kroger. Over the weekend, Walker’s Facebook post was shared more than 5,000 times. Chili’s Facebook and Twitter accounts were flooded with criticism.
.@Chilis 1) Have you apologized to this vet? 2) Has this employee been disciplined? 3) What training are you planning to avoid this again? “I will certainly not be dining at Chili’s Grill and Bar while they remain silent on hiring racist or bigoted staff who assault African-American veterans,” reads another. Chili’s has said on social media that its parent company, Brinker International, is working to address the issue. Brinker International did not respond to Business Insider’s request for comment. @Bebos4912P We’re taking this situation very seriously & the leaders in our company are actively involved with the goal of making it right! According to CBS 11, Walker and his attorney are planning on meeting with representatives from Brinker International on Monday. Walker’s attorney says that a Brinker attorney apologized to her on behalf of the company. The US has seen a rise in racially-motivated attacks following the election of Donald Trump on Tuesday. Representatives from two organizations that track hate crimes, the Southern Povery Law Center and the Council on American-Islamic Relations, told USA Today that they have seen a much larger number of people reporting hate crimes than is typical since the general election. November 14, 2016. Tags: Chili's, Donald Trump, Ernest Walker, Politics, Racism, Veteran's Day. Donald Trump, Holidays, Racism. Leave a comment. October 25, 2016. Tags: Education, halloween, Political correctness, Politics, Racism. Education, Holidays, Political correctness, Racism. 1 comment. October brings fall weather and Halloween. If you choose to participate in Halloween activities, we encourage you to think about your choices of costumes and themes. Some Halloween costumes reinforce stereotypes of particular races, genders, cultures, or religions. Regardless of intent, these costumes can perpetuate negative stereotypes, causing harm and offense to groups of people. Also, keep in mind that social media posts can have a long-term impact on your personal and professional reputation. The University of Florida’s Division of Student Affairs Diversity and Social Justice Statement reminds us that UF fosters a community that values and respects diversity. An inclusive definition of diversity recognizes the variety of personal and social experiences that make individuals and communities different from one another. As a community, we aspire to demonstrate integrity, respect, and compassion that strives to maintain an affirming campus climate for all members of our community. If you are troubled by an incident that does occur, please know that there are many resources available. Please take advantage of the 7 day a week presence of the U Matter, We Care program at the University of Florida by emailing umatter@ufl.edu. Additionally, there is a 24/7 counselor in the Counseling and Wellness Center available to speak by phone at 352-392-1575. Lastly, the Bias Education and Response Team at the University of Florida is able to respond to any reported incidents of bias, to educate those that were involved, and to provide support by connecting those that were impacted to the appropriate services and resources. You may submit a bias incident report at http://www.umatter.ufl.edu/stopbias . Thank you for being mindful of these values, and have a fun and safe Halloween. October 13, 2016. Tags: halloween, Political correctness. Holidays, Political correctness. 2 comments. November 7, 2015. Tags: Education, halloween, Holidays, Humor, Ivy League, Political correctness, Videos, Yale, Zero tolerance. Education, Holidays, Political correctness. Leave a comment. December 24, 2013. Tags: Christmas, Merry Christmas. Holidays. 8 comments.